Using the Huygens Software you can make simulations of Image Formation for many Microscope Types. 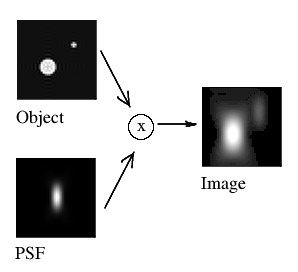 Image formation is simulated through a Convolution plus an optional adition of Photon Noise. The synthetic object used in the simulation is convolved with a theoretical Point Spread Function (PSF), calculated for the desired optical conditions as given by the Microscopic Parameters. See Convolution. A BackGround can be added after that step. Noise can be also added using a Gaussian distribution or, more adequately for Photon Noise, a Poisson Distribution. This can be done interatively using Huygens Professional. Simulations can also be programmed in Huygens Scripting (Hu Tcl Useful Procedures gives some useful examples of routines), leading to applications like the Micro Rotation Workbench used in the Automation Project. See some accessible examples in Convolving Trains.